By the end of this week, Downtown Disney will bid farewell to three more original tenants, and see shuttered more recent additions like the Earl of Sandwich and the district's second Starbucks. The latter may return to the Disneyland Resort, possibly inside the new hotel slated for construction on the west side of the shopping plaza. The AMC Theaters is relocating to a smaller venue across Harbor Boulevard, taking over the remaining screens of a defunct theater in Anaheim's Garden Walk. 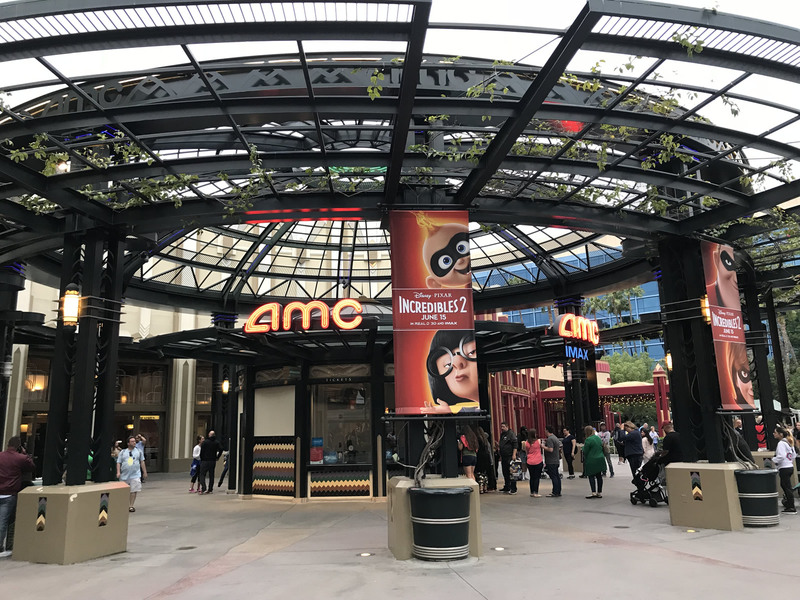 The AMC theater stayed through the opening weekend of "The Incredibles 2," but closed Sunday night. Photo by Adrienne Vincent-Phoenix. The Rainforest Cafe in Downtown Disney closes Tuesday night. Photo by Adrienne Vincent-Phoenix. The ESPN Zone is closed, although the marquee and big screens are still on. Photo by Adrienne Vincent-Phoenix. 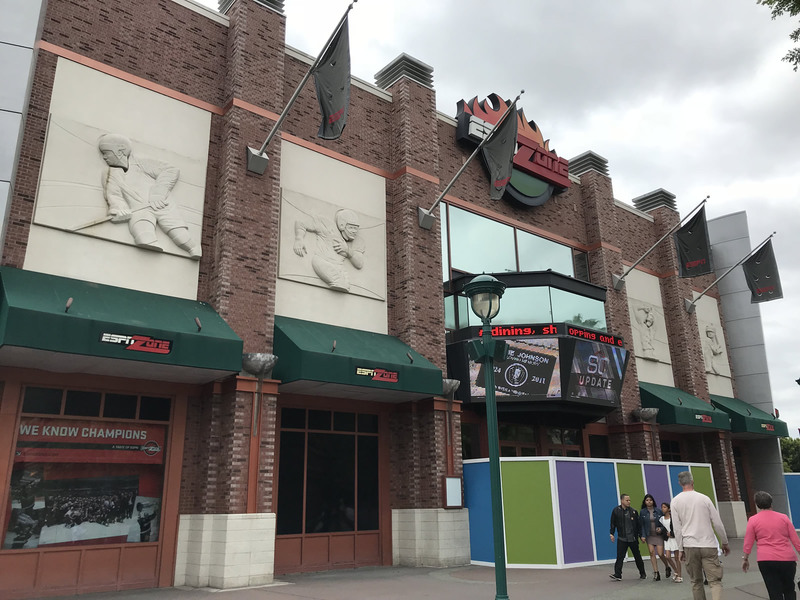 But the last remaining ESPN Zone is now history, and the Rainforest Cafe plans to close its doors Tuesday night. A large chunk of the current Downtown Disney parking lot is already closed off, providing a staging area for the load-out and pending demolition of the various businesses. Disney has not said when it plans to close that parking lot entirely, but that should almost certainly happen as the heavy demolition and construction begins. Pixar Pier opens to the public this Saturday, following two days of previews for media and invited guests, and the $300-per-person Pixar Pier Premiere event (tickets for that party are still on sale...). As we reported last week, Paradise Pier is entirely closed this week while crews rush to get the new area ready. Closed through this Friday, June 22 are Toy Story Midway Mania, the adjacent Midway Mercantile store, Knick's Knacks, and the Adorable Snowman Frosted Treats stand, and a work wall is now in place at the base of the bridge to Pixar Pier. 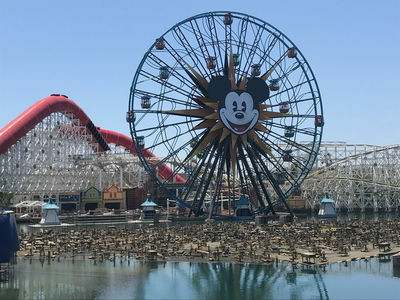 Ride operators were testing the new Incredicoaster and the Pixar Pal-a-Round last week, and both rides are expected to be open by Saturday. However, with all of the scaffolding around Incredibles Park, the new entrance to the Incredicoaster, it seems—forgive me—incredible to think that area will be 100 percent ready when the first crowds line up to ride. Also announced to be opening on Saturday are the Games of the Boardwalk, with new Pixar-themed games. Signs for these games have been in place for a few weeks, including Wall-E's Space Race. 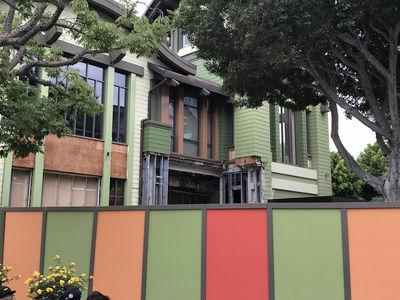 The Poultry Palace—the replacement for Don Tomas Turkey Legs—is slated to open this week, but the building still had bare plywood and exposed insulation earlier this week. From the exterior, it appears that the Lamplight Lounge is ready to welcome diners this weekend. Disney has posted the full menu (yes, the lobster nachos are back), and opened online reservations for the lower-level dining room. The restaurant is booked solid for the first 10 days of operation, but if you're willing to eat early or late, you can find some openings after Independence Day. You can also brave the line for a table on the upper level patio, but expect the wait to be considerable. Todd Pickering and I will be on hand Thursday night to preview Pixar Pier, so be sure to watch MousePlanet's Twitter, Facebook, Instagram, and Periscope accounts for photos and impressions from the preview. What's up with World of Color? A Disneyland spokesperson confirms to MousePlanet that the World of Color nighttime show will not reopen this week as originally scheduled. "World of Color is undergoing an extended refurbishment and the show is expected to return towards the end of this year." The nighttime show at Disney California Adventure closed earlier this year for refurbishment, and to allow for the Pixar Pier conversion. But then something seemed to go terribly wrong, in the form of a large gaping hole in one of the three platforms that support the thousands of fountains used in the show. The show uses three such platforms, which can be raised and lowered individually, and are usually underwater except for maintenance. 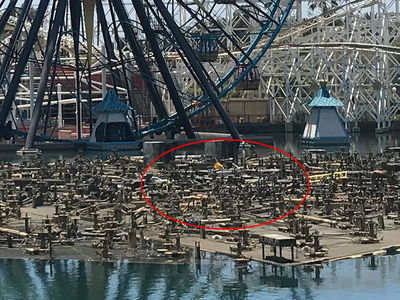 A very few photos of the damage circulated on social media in late May, but Disney officially maintained that the show was simply closed for scheduled refurbishment, and would reopen with Pixar Pier. More recent photos, including the following taken two weeks ago, show no hole in the platform, although a section of the equipment is newer and shinier, as if it had been recently repaired or replaced. 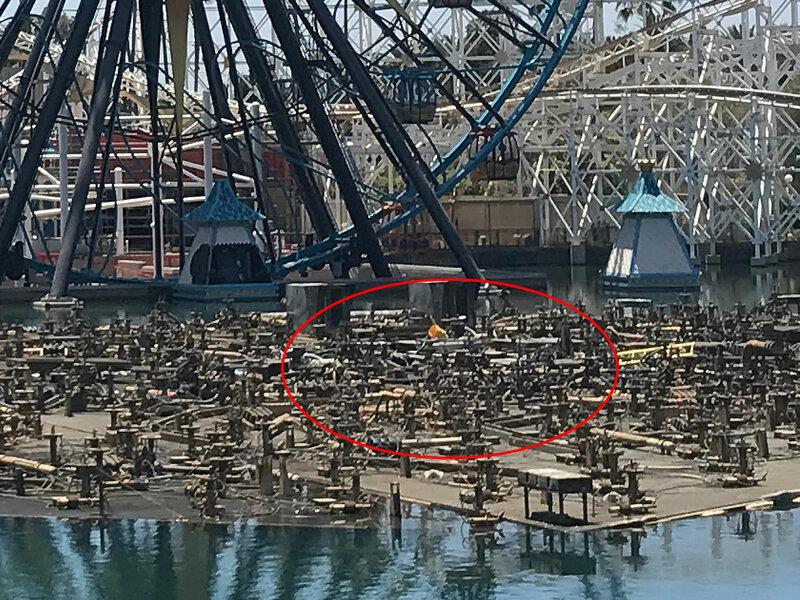 The World of Color platform appears intact in this photo, taken June 8, 2018. Photo by Adrienne Vincent-Phoenix. Photos posted to social media in late May show a large hole or flooded section of this platform. The equipment in this area looks to be recently repaired or cleaned. Photo by Adrienne Vincent-Phoenix. While the Disneyland website still states the show will return in late June, the entertainment schedule was updated since Monday to remove all showtimes. Earlier this month Disney stopped accepting reservations for World of Color dining packages, and began calling guests with World of Color reservations to cancel their meal, and offering rebook a Fantasmic or Paint the Night package. Disney points out that the delayed return of World of Color will give visitors more time in Pixar Pier, and to ride the Incredicoaster and the Pixar Pal-a-Round at night. Those rides, along with the Golden Zephry, Jumpin' Jellyfish and the Silly Symphony Swings, close during performances of the World of Color. 'Tis the season for many annual passholders to be blocked out for the summer, and this is the final week Southern California Select and Southern California annual passholders can visit until August 20. The Southern California Select pass is valid this Monday, June 18, through Wednesday, June 20. As currently scheduled, Southern California Select annual passholders are blocked out June 21 through August 20. Holders of the legacy Southern California passport can now visit on June 20, 21 and 22, and are blocked out June 29 through August 20. Fo Deluxe annual passholders, Saturday blockouts apply until August 18. As a reminder, the annual passholder bring-a-friend offer announced last week is not valid on blockout dates. The tickets are only good for admission on the date they are purchased. Registration is now officially open for the 2018 CHOC Walk in the Park, to be held Sunday, August 26 at the Disneyland Resort. Team MousePlanet will return for our 11th consecutive walk to support Children's Hospital Orange County. Thanks to the efforts and generosity of our readers, Team MousePlanet has raised over $70,000 for CHOC since 2008. We invite MousePlanet readers, friends, and family members to join our team for the event. CONVENIENCE! If you register during Early Bird registration and meet your fund raising goal, Team MousePlanet will handle check-in for you. No need to drive to Orange the week before the walk to collect your wristband and T-shirt. You need only meet us in Downtown Disney the morning of the walk to collect your goodies, then head right into Disneyland to start the walk. 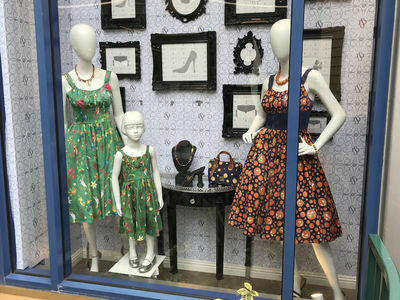 ...The Disney Dress Shop has introduced a collection of youth dresses to match some of the most popular adult styles. 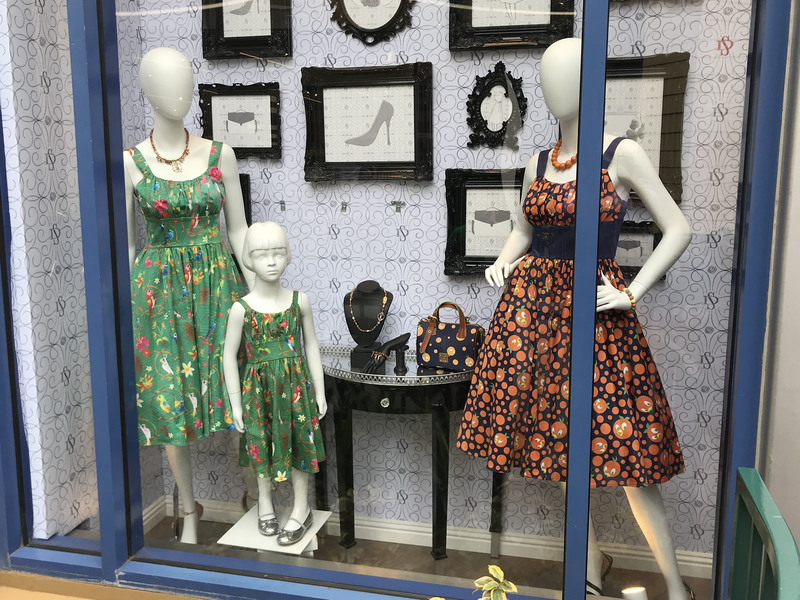 Your mini-me can sport an Enchanted Tiki Room dress or a Mary Poppins gown from the Disney Dress Shop. Photo by Adrienne Vincent-Phoenix. 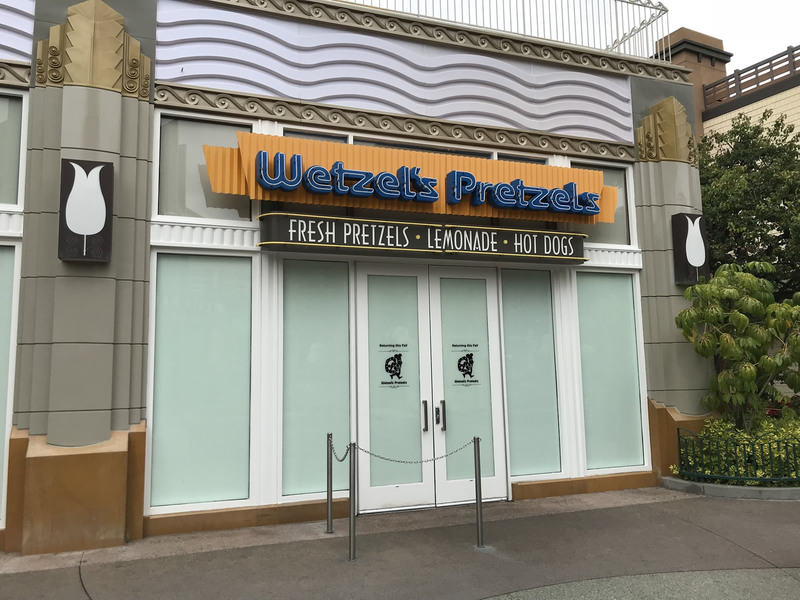 Wetzel's Pretzels is closed for refurbishment, and a sign on the door says the location will reopen this fall. Photo by Adrienne Vincent-Phoenix. Naples is open during refurbishment, although the dining room capacity is limited. Photo by Adrienne Vincent-Phoenix. Tomorrowland Theater – closes for refurbishment July 16, following close of the Ant-Man and the Wasp preview. No announced replacement, and it's unclear if Star Wars: Path of the Jedi will return. Big Thunder Mountain Railroad – closes for refurbishment July 16. Reopening date unknown, but after July 22. World of Color – closed for refurbishment. Scheduled to return on Friday, June 22, but may be delayed. Pixar Shorts Film Festival – on hiatus. Reopens July 20 with a new lineup of three short films. Games of the Boardwalk – reopens June 23. California Screamin' – becomes the Incredicoaster when it reopens June 23. Mickey's Fun Wheel – becomes the Pixar Pal-a-Round when it reopens June 23. Don Tomas Turkey Legs – becomes the Poultry Palace; reopens June 23. Hot Dog Hut – becomes Angry Dogs; reopens June 23. Ariel's Grotto – becomes the Lamplight Lounge; reopens June 23. Cove Bar – becomes the Lamplight Lounge; reopens June 23. The following attractions will close by the end of summer to make room for Super Heroes land. AMC Theaters – now closed; building will be demolished. ESPN Zone – now closed; building will be demolished. 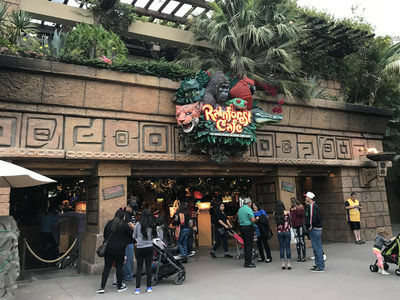 Rainforest Cafe – expected to close June 19; building will be demolished. 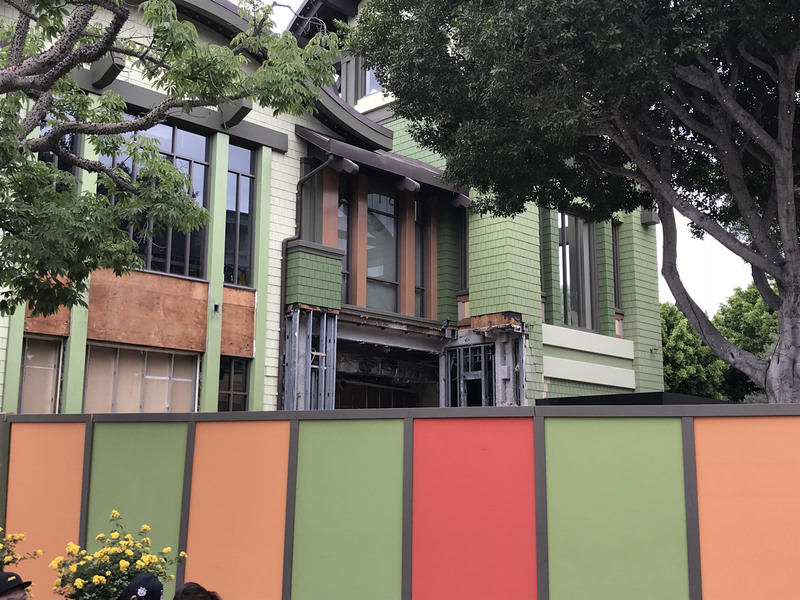 Earl of Sandwich – expected to close June 23; building will be demolished. Starbucks (West Side) – expected to close June 23; building will be demolished. Alamo Rent-a-Car – scheduled to close by June 30; rental office will relocate to Paradise Pier hotel. Pinocchio's Workshop (group childcare) – closed. The space will be converted to the hotel fitness center. Pixar Fest – April 13 to September 3. Highlights include the new "Together Forever – A Pixar Nighttime Spectacular" fireworks show, as well as performances of the Paint the Night parade in Disney California Adventure, and the Pixar Play Parade in Disneyland. Pixar Pier premiere event – Friday, June 22. The 6-hour event, scheduled the evening before the area officially reopens to the public, offers exclusive access for a "very limited" number of buyers to the rethemed Paradise Pier area of Disney California Adventure. Tickets are $299 per person, available from the event website. CHOC Rock'n Luau at Splitsville Luxury Lanes – Saturday, August 25. Tickets go on sale July 1 at the event website. CHOC Walk – Sunday, August 26. Registration is now open. We invite MousePlanet readers, friends, and family members to join our team for the event. Taste of Downtown Disney – September 5. Details to come. Mickey's Halloween Party at Disneyland – September 19, 21, 24, 26, 28; October 2, 5, 9, 12, 16, 19, 23, 26, 29, 31. Advance purchase tickets for the Halloween Party went on sale to Disneyland Resort Annual Passholders on Tuesday, June 5. Tickets go on sale Tuesday, June 12 to the general public. Gay Days at Disneyland (unofficial event) – October 5–7. More information on the event website. Moonlight Magic after-hours event for Disney Vacation Club members – Thursday, November 15. Reservations open October 4. D23 Expo – August 23–25, 2019. Tickets go on sale August 23, 2018 via the event website. Disneyland prices as of February 11, 2018. * So Cal Resident tickets expire May 24, 2018, and are blocked out March 23 through April 8, 2018. Click here for additional terms and conditions. Landry's Select Club – members of the Landry's Select Club get priority seating at the Rainforest Cafe when available (which makes a huge difference on busy days). This club replaces the former Rainforest Cafe Safari Club, and runs on a point-based system that gives you a $25 gift certificate after you spend $250. Membership now costs $25, but comes with a $25 birthday reward. We recommend that you pre-purchase your membership before your visit so you can take advantage of the priority seating benefit. Bring-a-Friend ticket discount – Now through September 3, Disneyland Resort annual passholders can purchase one-day park-hopper tickets for friends and family at a savings of up to 40% off the ticket booth price. This new Bring-a-Friend offer is similar to a promotion announced last week for Walt Disney World, though the terms are a bit different. Passholders can purchase these discounted tickets in person at the Disneyland Resort ticket booths, or at the Disney Desks at local Good Neighbor Hotels. Passholders can only purchase these tickets for days their own pass is valid, and the offer is not valid on blockout dates. The tickets are only good for admission on the date they are purchased. GN – Grad Nite. May 4, 5, 11, 12, 15, 16, 18, 19, 22, 23, 29 and 30; June 1, 2, 5, 6, 8 and 9.